Peco Pl10 Point Motors X4.with extension pumps to make them into pl10E, All have been retested and rewired all are in good working condition. Please only serious offers,no time wasters.thanks. May be a bit dusty. PECO PL-11 Side Mount Point Motor. PECO PL-11. No holes to drill, and this unit is pre wired. Can also be used with 00/H0 Streamline Turnouts. SHEFFIELD TRANSPORT MODELS who have been in the model industry for over 30 years. 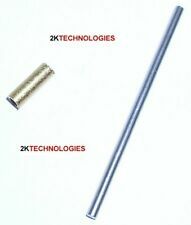 Peco Points Motors Suface Mount . Condition is Used. Dispatched with Royal Mail 2nd Class....sold as seen ....may need attention . Part of my train collection clear out. PECO PL-10E. Point Motor With Extended Pin. EZE-Wire 28070. Peco Type Point Motor Harness. Cables have correct connectors for Peco point motors. 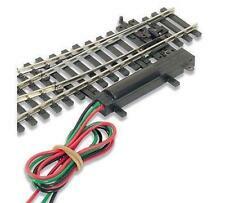 Ideal for easy wiring of Peco Point Motors on model rail layouts. EXPO Tools. 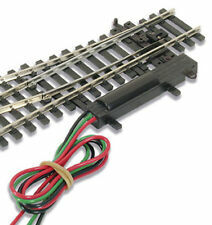 Plug and Play Wiring System for Model Railways produced by Expo Tools Ltd in UK. PECO and horby POINT MOTORS FOR 00 GAUGE. PECO and horby POINT MOTORS FOR 00 GAUGE.. Condition is all working removed from track. Dispatched with Royal Mail 2nd Class. Peco Code PL-12. Adapter Base for PL-10 series Turnout Motors fixing screws included. Can be used with most non-PECO turnouts, where the over-centre spring feature is not available. It can be affixed above or below the baseboard, and give the modeller the ability to "lock" the point blade in either position when used in conjunction with the PL-10 Turnout Motor. PRCO/HORNBY POINTS MOTORS. WE HAVE FOR SALE FOUR. SEE PICTURE. All motorised with Peco PL-10 turnout motors. PROBE PL-17 x 1. OO/HO/N GAUGE. POINT MOTORS PL-10 x 2. ACCESSORY SWITCH PL-13 x 2. All clean and with fishplates. Six in total. Peco PL-10 Point Motors x 6. Point motors have been striped from a layout and tested. We are enthusiasts and modelers who have successfully turned our hobby into our livelihood. Five Valley's Models. PECO PL-15 - 1 x TWIN MICRO POINT MOTOR ACCESSORY SWITCH - FITS DIRECTLY TO THE UNDERSIDE OF A PECO POINT MOTOR PL-10 OR PL-10E TO CHANGE POLARITY ON FROGS & SIGNALS. 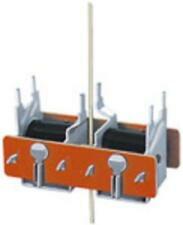 EASY TO ASSEMBLE UNIT WITH TWO SINGLE POLE CHANGEOVER MICROSWITCHES, GIVES DOUBLE THE SWITCHING CAPACITY OF PL-13. PECO PL-12X - 2 x STANDARD POINT MOTOR SURFACE MOUNTING PLATE 'KIT' - FITS DIRECTLY TO THE BASEBOARD NEXT TO THE POINT TO TAKE PL-10 POINT MOTOR. PECO KIT 2 - 6 x 30mm EXTENSION PIN KITS FOR PL-10 STANDARD POINT MOTOR - EXTENDS THE PIN FOR UNDER BASE BOARD MOUNTING ON PLATE PL-9 or PL12 or PL12X. This item is New and Unused. LOT OF 6 POINT MOTORS. WE VALUE YOUR SECOND HAND COLLECTIONS VERY HIGHLY. £7.50 FLAT RATE. WANTED: SECOND-HAND COLLECTIONS. TOP PRICES PAID. GOOD, UNBOXED CONDITION. 1 ITEM: £2.00. This is a collection of seven 00 scale Peco points as shown in the photos. All are in good working condition. They have been fitted with ZTC 302 point motors which have a built-in DCC decoder. 1 SL86 Insulfrog right hand curved point. PECO PL-11 - 1 x SURFACE SIDE MOUNTED POINT MOTOR - FITS DIRECTLY TO THE SIDE OF THE POINT AS SHOWN IN THE IMAGE. This item is New and Unused. 'OO' PECO INSULFROG POINTS. ALL MOTORS FIXED ON. WE VALUE YOUR SECOND HAND COLLECTIONS VERY HIGHLY. £7.50 FLAT RATE. WANTED: SECOND-HAND COLLECTIONS. TOP PRICES PAID. GOOD, UNBOXED CONDITION. 1 ITEM: £2.00. But you can also fit the servo under the layout as shown in the images above. The servo changes the point via a short connecting rod (supplied in kit). and the hole on the arm on the servo is used to get this linear (push-pull) motion. 'OO' GAUGE. WITH 2 POINT MOTORS FITTED. 3 WAY SLIP. WE VALUE YOUR SECOND HAND COLLECTIONS VERY HIGHLY. £7.50 FLAT RATE. GOOD, UNBOXED CONDITION. PECO PL-34 - 2 x Wiring Looms For PL-10 or PL-10E Point Motor. POINT MOTOR NOT INCLUDED. 6 x MOUNTING PLATES. LOT OF 6 POINT MOTORS. WE VALUE YOUR SECOND HAND COLLECTIONS VERY HIGHLY. £7.50 FLAT RATE. WANTED: SECOND-HAND COLLECTIONS. TOP PRICES PAID. GOOD, UNBOXED CONDITION. Get In Touch. Get Social. WORKING ORDER: Yes. LOT OF POINT MOTORS & SWITCHES. 6 x ON / ON SWITCHES. WE VALUE YOUR SECOND HAND COLLECTIONS VERY HIGHLY. £7.50 FLAT RATE. WANTED: SECOND-HAND COLLECTIONS. TOP PRICES PAID. GOOD, UNBOXED CONDITION. 1 ITEM: £2.00. PECO SL-92. PECO SL-97. PECO PL-10E. ASSORTED 'OO' POINTS POINT MOTORS. SOLENOID POINT MOTOR. SMALL RADIUS LEFT-HAND POINTS. (BOTH POINT MOTORS ARE STILL SEALED IN THE BOXES /. THE POINT BOXES ARE A LITTLE TIRED). Peco Code PL-27 Switch Mounting Console, holds upto 6 switches, switches are not included. Peco OO Gauge Points x4 With PL10 Point Motors Fitted. Condition is Used. Dispatched with Royal Mail 2nd Class. For use with 00/H0 Gauge. Peco PL-11. Side Mounted Turnout Motor (Switch Machine). 'OO' GAUGE. LOT OF 3 POINTS WITH MOTORS. 3 x SL-91 RIGHT-HAND POINTS WITH MOTORS. WE VALUE YOUR SECOND HAND COLLECTIONS VERY HIGHLY. GOOD, UNBOXED CONDITION. 'OO' PECO CODE 100 INSULFROG POINTS. FITTED WITH SOLENOID POINT MOTORS. 2 x LARGE RADIUS RIGHT-HAND POINTS. SMALL RADIUS RIGHT-HAND POINT. WE VALUE YOUR SECOND HAND COLLECTIONS VERY HIGHLY. £7.50 FLAT RATE. 'OO' GAUGE. LOT OF 3 POINTS WITH MOTORS. 3 x RIGHT-HAND POINTS WITH MOTORS. WE VALUE YOUR SECOND HAND COLLECTIONS VERY HIGHLY. GOOD, UNBOXED CONDITION. ONE POINT NEEDS CLEANING. PL-12 ADAPTOR BASE. LOT OF 6 POINT MOTORS. WE VALUE YOUR SECOND HAND COLLECTIONS VERY HIGHLY. £7.50 FLAT RATE. WANTED: SECOND-HAND COLLECTIONS. TOP PRICES PAID. GOOD, UNBOXED CONDITION. Condition is New and unopened but backing cards are grubby. LOT OF 6 POINT MOTORS. WE VALUE YOUR SECOND HAND COLLECTIONS VERY HIGHLY. £7.50 FLAT RATE. WANTED: SECOND-HAND COLLECTIONS. TOP PRICES PAID. GOOD, UNBOXED CONDITION.